Sustainability courses and programs have been proliferating on college and university campuses over the last decade. 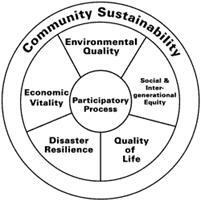 However, education focused on sustainability is not based on a shared consensus of important concepts or curricular organization. What are the big ideas, learning outcomes, and skills that courses and programs should be designed around? What should we expect students of sustainability to know and do? What are coherent pathways and preferred pedagogies to help students achieve sustainability learning objectives? This web site doesn’t address all of these unknowns. But it does offer lists of big ideas, learning outcomes, skills and references that are relevant to an education focused on sustainability. What follows are a series of web pages, each featuring a list of big ideas, learning outcomes, or skills that could be featured in a sustainability course or curriculum. As sustainability is a very broad and transdisciplinary concept, any list of what could be included in a sustainability education can be very large. The challenge is in choosing what to focus on in any given course. If nothing else, these lists can serve as the basis for a glossary of sustainability course content. This listing of big ideas, learning outcomes, and skills has been developed over time through a series of workshops hosted by the Curriculum for the Bioregion, an initiative of The Washington Center at The Evergreen State College. Over 100 faculty members from over a dozen colleges and universities in the state of Washington have contributed to this list. In 2011 a Sustainability Faculty Learning Community was formed, consisting of ~15 faculty members from 10 colleges. This group of academics discussed and beefed up the list considerably. Rob Turner of University of Washington Bothell re-organized the list in the categories seen in the matrix below, added more terms, simplified the language of the list, and included links to relevant references. The link that follows this sentence is a much more succinct take on this summarizing of sustainability big ideas, skills, and habits of mind created by Dr. Claus Svendsen of Skagit Valley Community College. Sustainability Infusion Flow Chart. Web Site Pages - Click a title and go! Have any problems with this web site or questions? Contact Rob Turner at rturner@uwb.edu.